The unicorn – a horse with a horn on its forehead – is a frequent subject for sculpture. The position of the horn varies almost not at all, and the only difference from one unicorn statue to another is the general treatment of the horse, and the size and length of the horn. 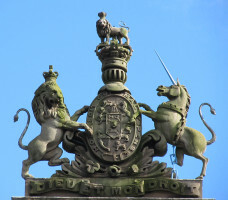 There is one other difference from most horse statues though – the unicorn is almost invariably a heraldic beast, and thus associated with a shield of arms, or most usually, part of a coat of arms as a supporter. 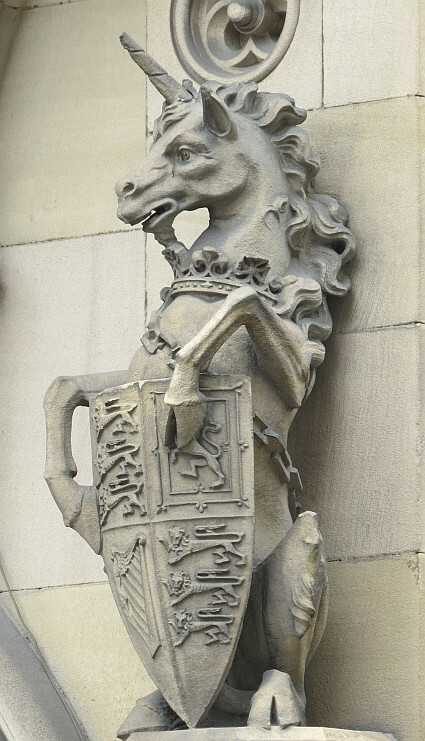 The fine unicorn at the top of the page is typical in this respect, with one foreleg raised to hold a heraldic shield. 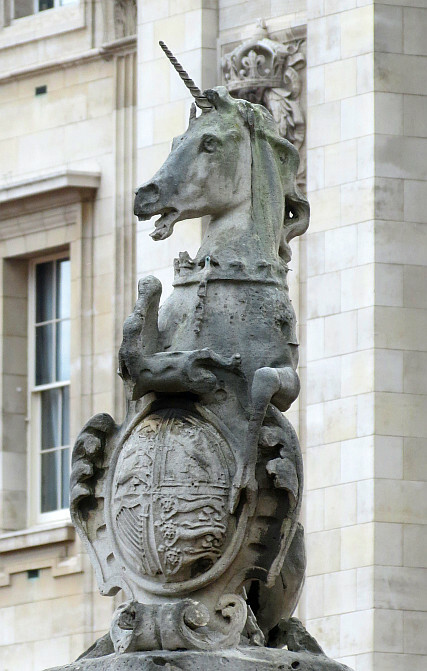 It looks naturally posed until we think a moment – to get a horse to prop up a shield in this way, which in this case requires it to sink down its hindquarters so as to lay the lower parts of its back legs against the ground would be quite unlikely. 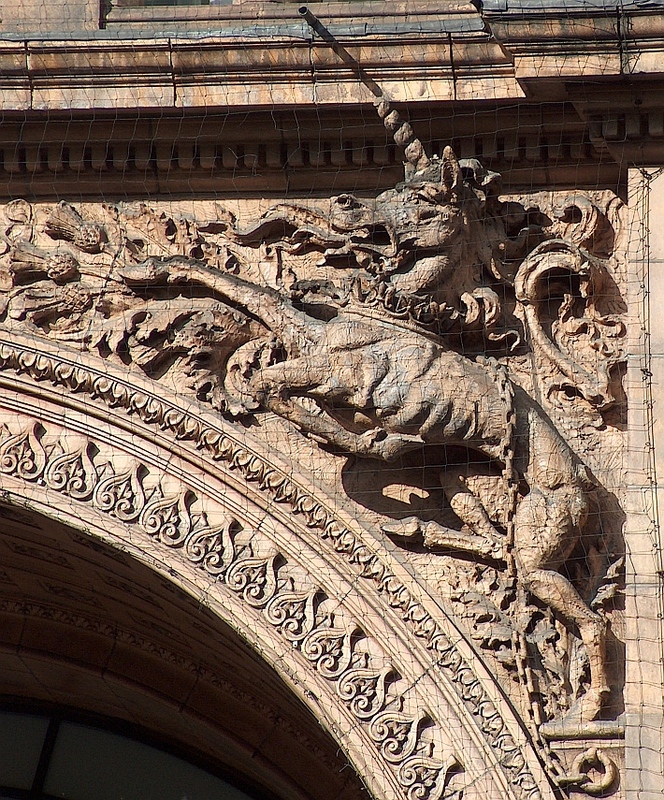 Unicorn statue in terra cotta, upright stance . An alternative pose for our unicorn to hold up the shield is to rear up and sit back on its haunches, as in this terra cotta unicorn, which unfortunately has lost most the horn. 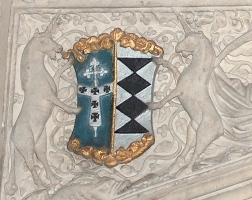 Here he clasps the shield with both front legs – one over the top, the other at the side – the pose is completely heraldic, and is termed ‘rampant’, thus a ‘unicorn rampant’. Variations on the unicorn rampant (rearing up) . Here are three more. 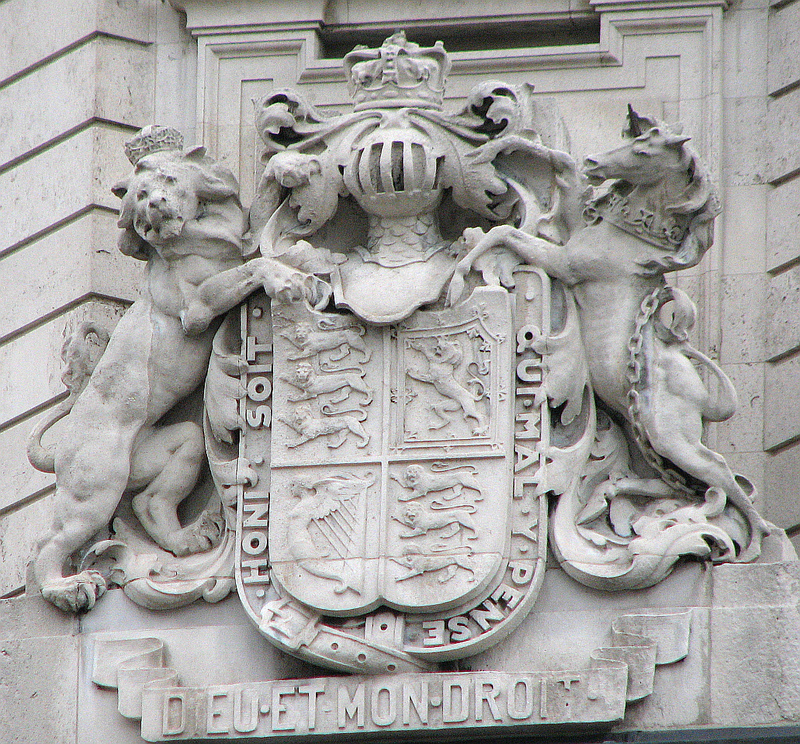 The one above left is shown in more or less front view, and we see that again it has one hoof on the side – rather an odd hoof – and one on the top of the shield. 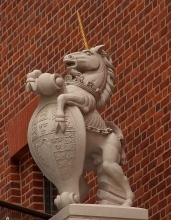 The central one, rather small, has a similar pose, but is not really able to hold the shield with the hoof on the side, so the effect is of steadying rather than holding it. 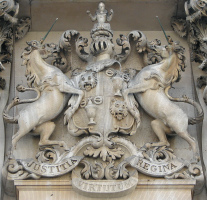 The unicorn on the right, most finely modelled, is both holding the shield upright and pressing it against its stomach. 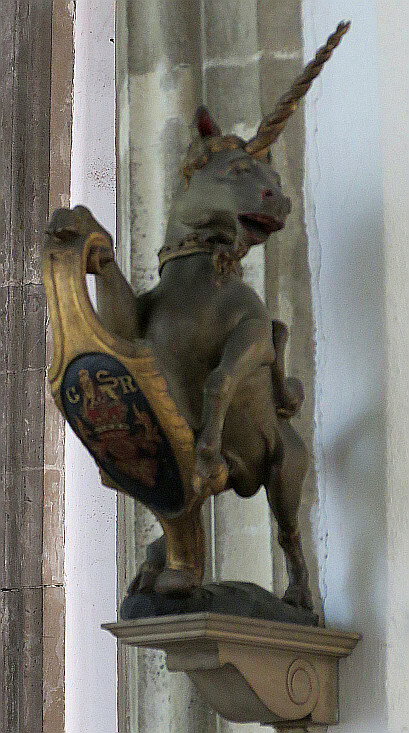 This rather splendid unicorn statue, with gilt horn and crisply modelled musculature, again has cleft hooves. We can see particularly clearly the spiral groove on his horn, which is characteristic of most unicorns. 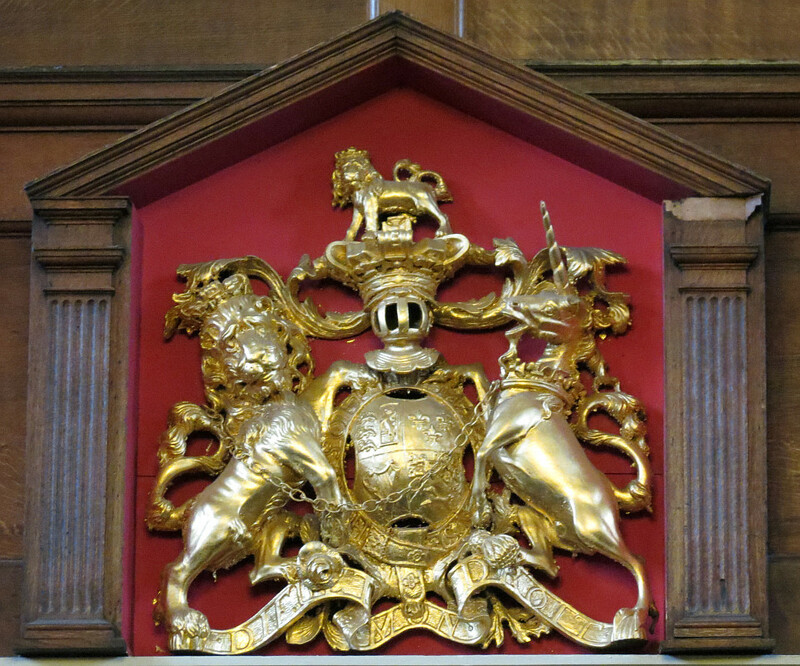 We also see that the shield is the Royal arms, so this is a Royal heraldic unicorn, and as such, it wears a crown about its neck and a chain. 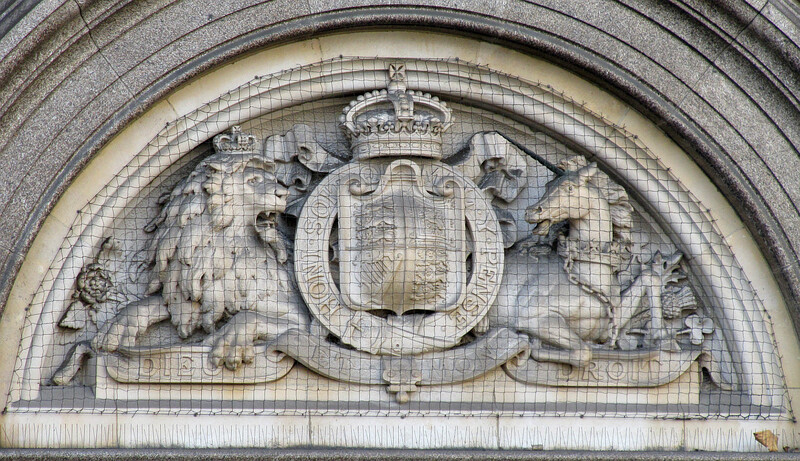 You can see the chain on the unicorns above with the Royal coat of arms. 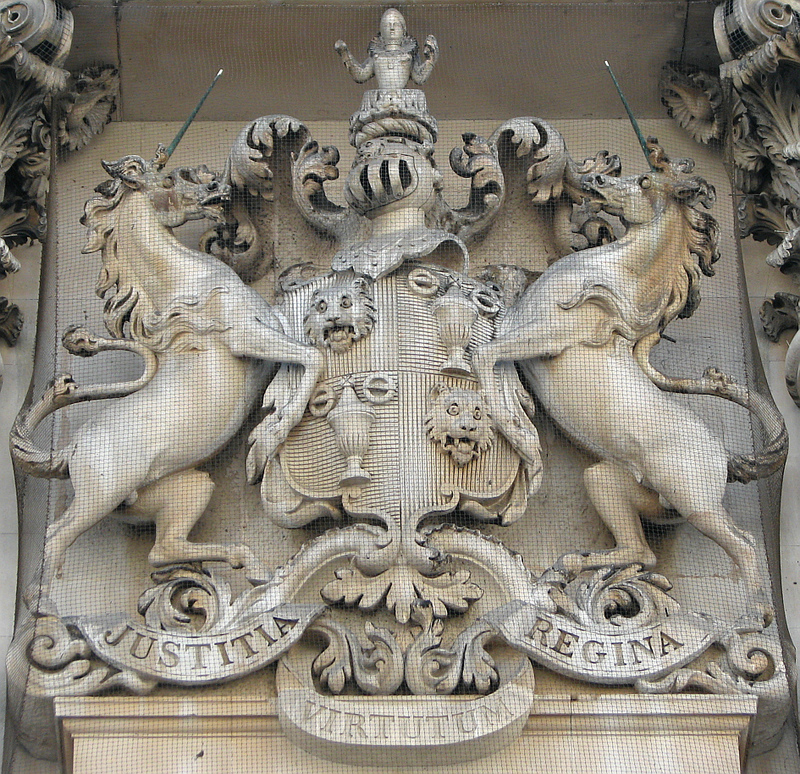 Unicorn in the Royal coat of arms . 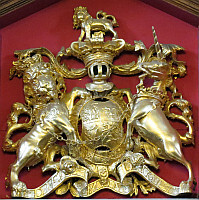 Unicorn in the Royal coat of arms, examples . 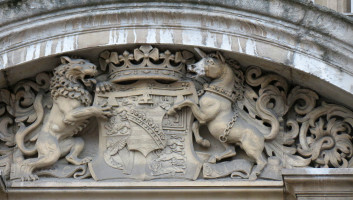 The first example above shows the unicorn and lion bodies even more similar, with similar musculature to body and legs, and both with their ribs showing. 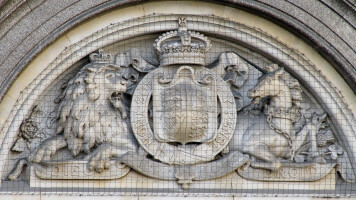 The scale of the shield is such that between them, the lion and unicorn can almost encircle it with their arms and feet, and the body of the unicorn is enough forward that it is rearing rather than rampant. 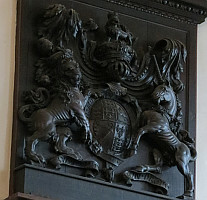 Next, a gilt carving in wood, where the horse body of the unicorn is more horsey, and the lion more leonine, though his head is too big; both are more vertically oriented. We see the chained crown particularly well – the chain here going to the lion; and note the helical groove on the horn, and the symmetrical tails of the two beasts. 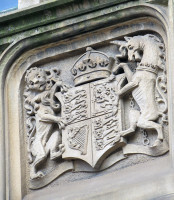 Then a very grand carved stone group, where the lion and unicorn are extremely naturalistic, with a much larger shield so that rather than supporting, the animals are almost climbing up the sides, and the unicorn’s hooves are at the top of the shield and on the plumage of the knight’s helm. 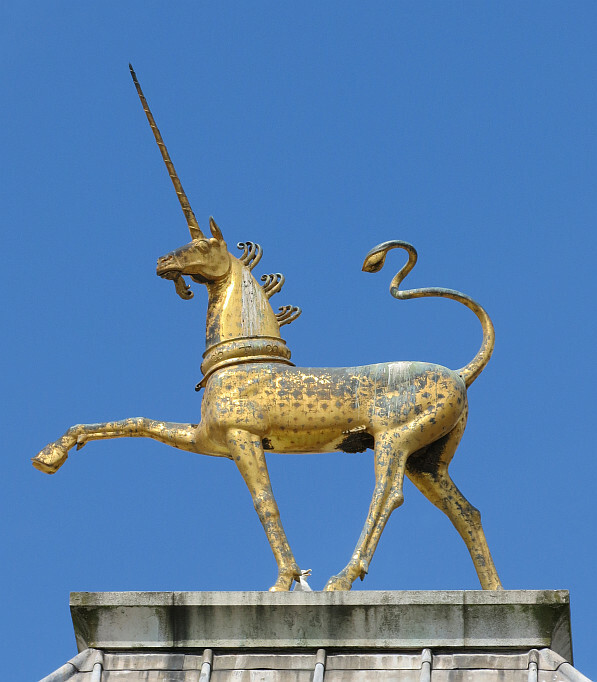 This unicorn statue seems inspired by George Stubbs. 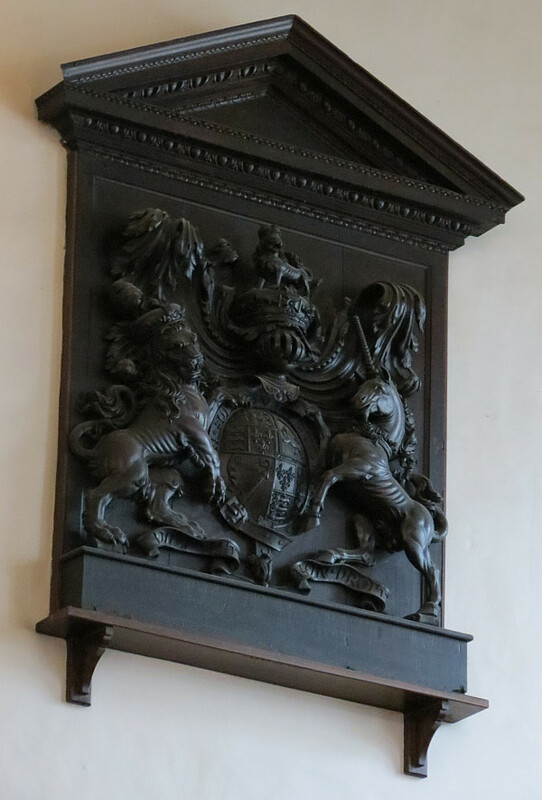 Contrast this with another larger unicorn, above right, with oversized head, and seeming to barge in to the central shield rather than support it; unusually, the far foreleg in this case is completely unseen. 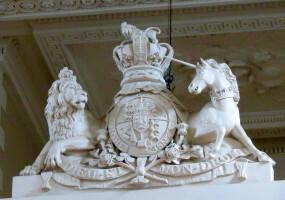 More Royal arms with unicorn sculpture . 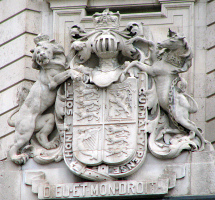 More examples of the Royal arms. 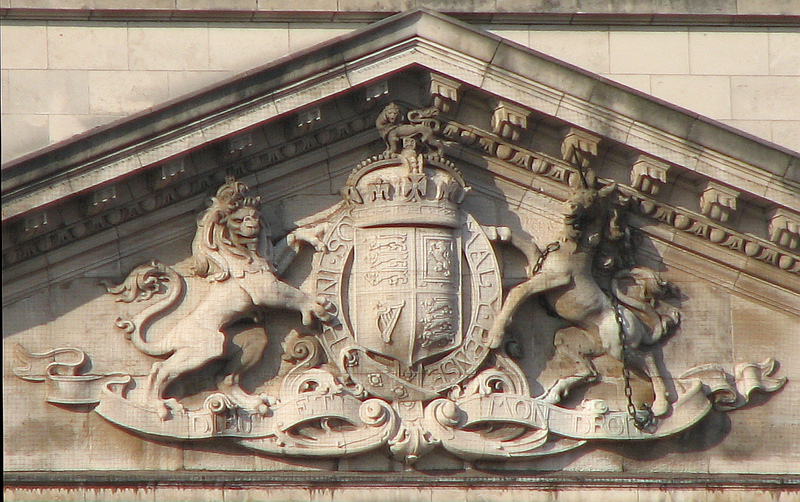 Above left, a decorative treatment, neatly filling the space within a curved pediment, and with the tails of the unicorn and lion becoming the swirly foliage to left and right; the central crown above the shield has been enlarged and made more decorative too. 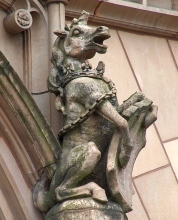 A moderately horselike body to our unicorn, but the head and neck again rather large. 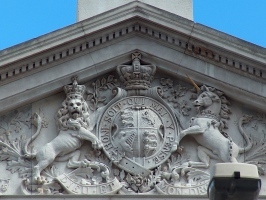 Then another gently curved pediment, here with the sculpture rather flattened, and a blank backing. 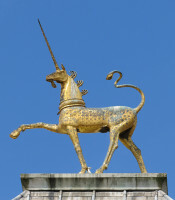 The unicorn has an exaggeratedly large chest and thin rump as if it were a greyhound, but the neck is splendidly curved and maned. 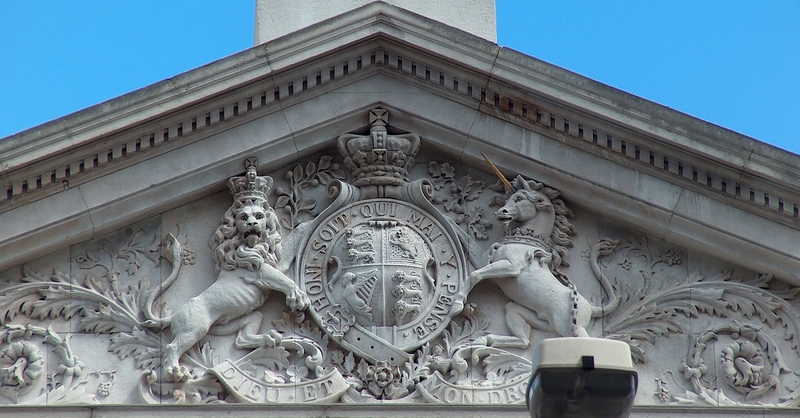 Next, another pediment on the grandest scale, with the lion looking forwards, the unicorn inwards, but otherwise a strong parallel in the poses, with similar poses to tail and legs – the stretched forwards further foreleg of the unicorn is unusual. 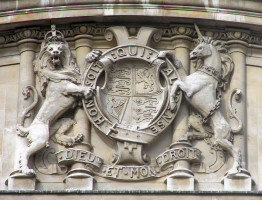 And on the right, a simplified relief sculpture of the Royal arms, with vertically standing unicorn and lion, with the unicorn’s neck bent round to fill the curved corner of the space available, and legs shortened rather excessively. Sculptural variations on the unicorn theme . Here we have some variations. 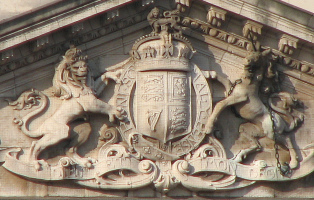 Above left, the unicorn and lion are sitting, outward facing, heads turned inwards. This means they flank rather than support the central coat of arms in any way, but apart from that, they maintain something of a symmetry, and our unicorn has the usual chained crown around its neck, and spiral-grooved horn. 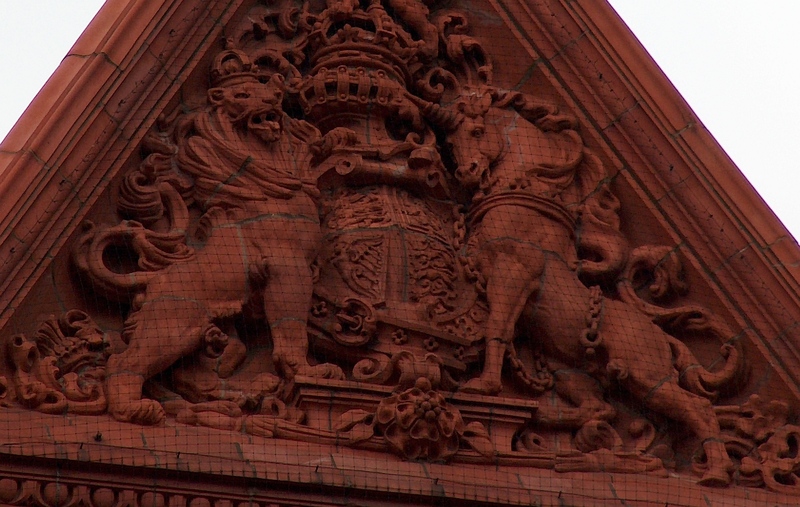 Then an example of terra cotta sculpture, with a richly surfaced design with the unicorn and lionrearing up on a plinth but not supporting the central shield. 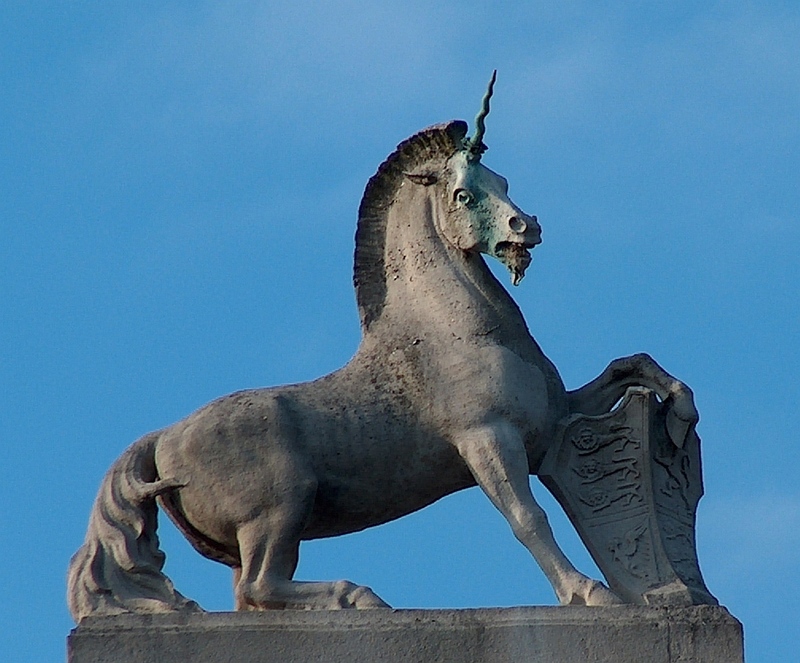 There is little of the attributes of a horse to the powerfully muscular, stretching body of this unicorn. Next, another outward facing pair of sculptures, again with the unicorn very horsey, and a rather fine horn. 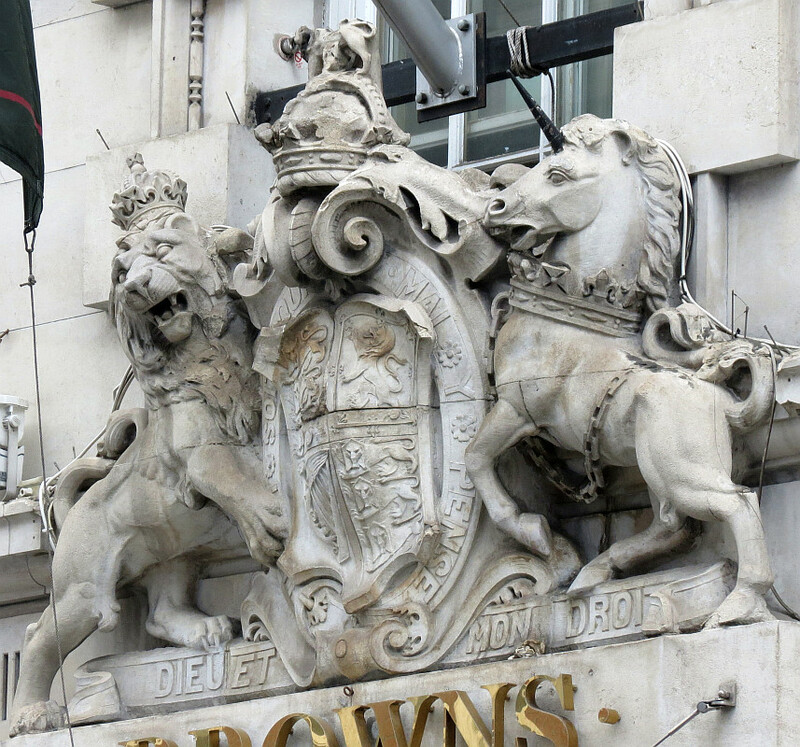 The crown is in place around the unicorn’s neck, but no chain is in evidence in this case. 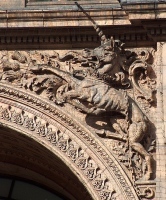 Above right is just one half of the pair, in the right hand spandrel of a great arch, so the unicorn is pointing rather than supporting with its outstretched hoof. This is another example of the greyhound type of body, and alas there is some damage, with part fo the tail and part of the horn having been lost. Unicorns as non-Royal emblems . We can also find the unicorn associated with other coats of arms, usually in pairs. 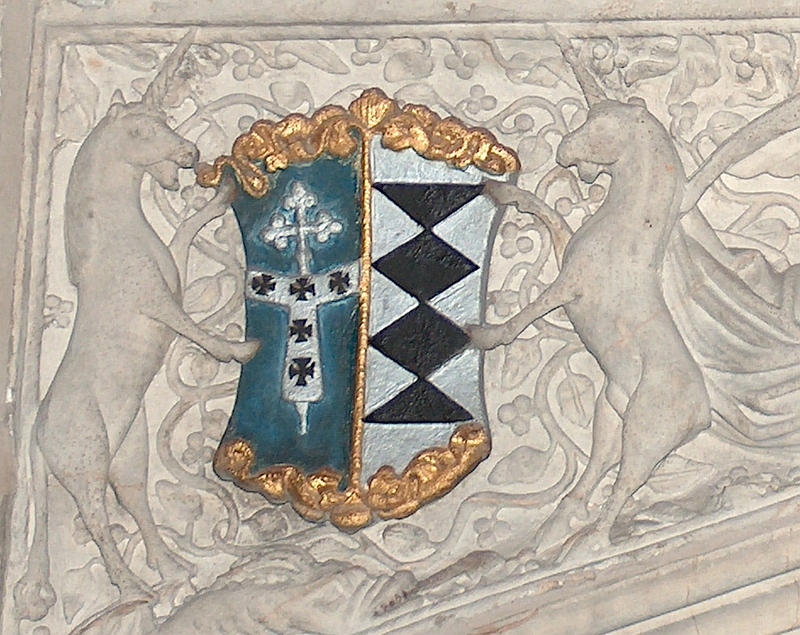 Above left is a pair of unicorns carved in low relief supporting a central painted shield; the pose of the back legs is more donkeylike than horselike, and the tail of the beast on the left hand side hangs straight down. The next one has two unicorns much more like the one of the Royal arms, with free-standing unicorn sculptures supporting the central shield and with the curvy tails we have become familiar with. 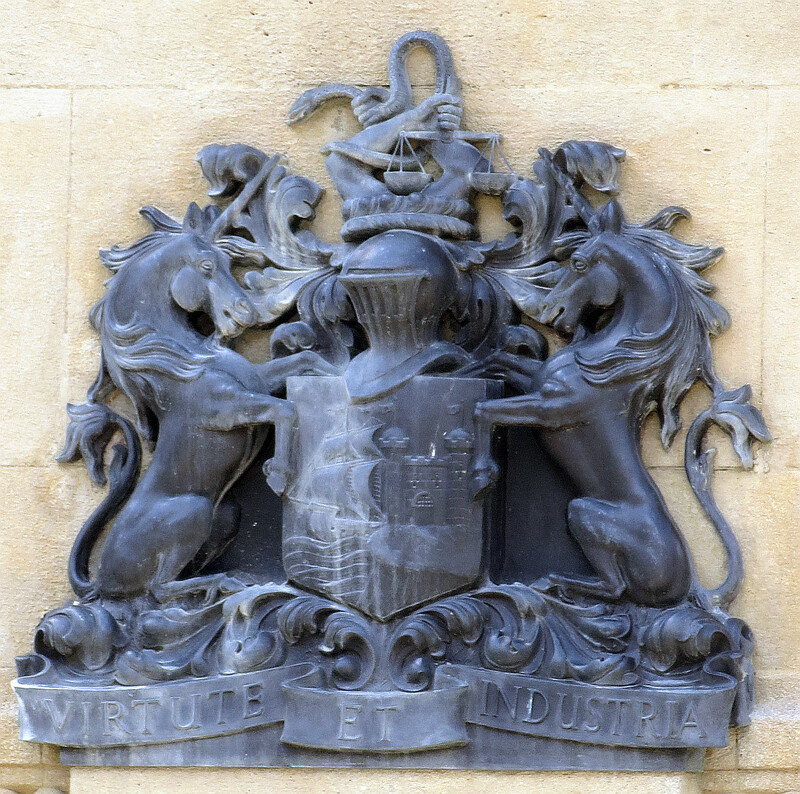 Bristol’s coat of arms has a pair of unicorns- third example above - note the long manes sweep across the neck, replacing the crown, for the Royal crown around the unicorn’s neck, and the chain, are absent from other coats of arms. 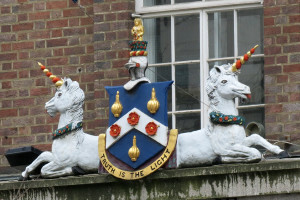 The example to the far right above is a painted, rather jolly example with two seated, outward facing unicorns, which would not look out of place in a seaside town. Again, there is something in front of the neck to replace the crown, though here it would look to be wreaths or garlands of flowers. 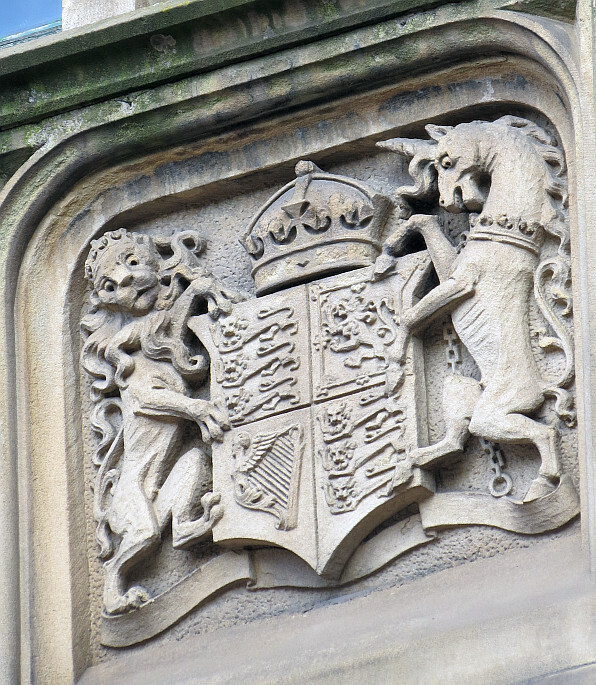 To end, I wanted to give a couple of examples without heraldic shields. 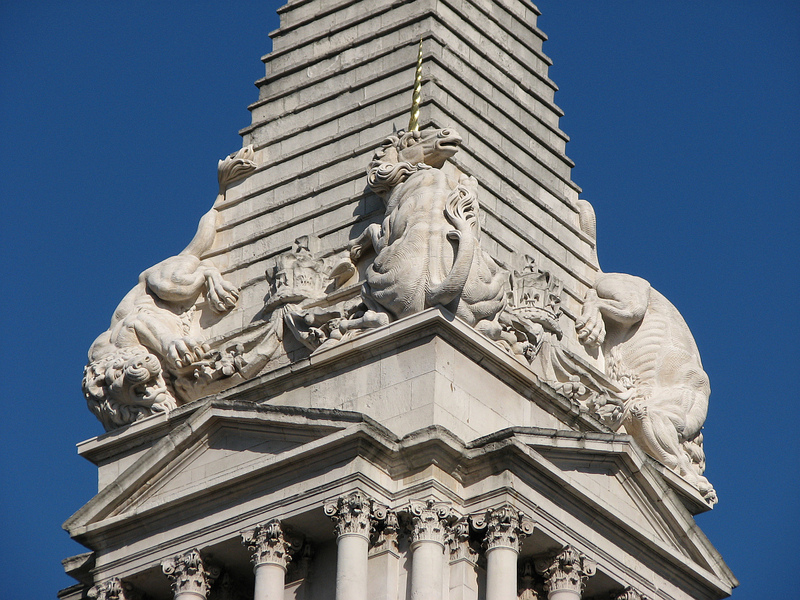 Above left is surely the largest unicorn sculpture in London, the massive one climbing up the spire of St George Bloomsbury, Hawksmoor’s church near the British Museum in London, along with other clambering beasts. 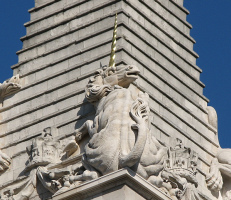 And above right is a summit unicorn statue, with flamboyantly curled tail, and rapier-thin horn.